We were delighted to announce in February that the Alice Hawkins collection will be shown for the first time ever on public display in our ‘Voice and Vote: Women’s Place in Parliament’ exhibition in summer 2018. Our Vote 100 volunteers Oonagh Gay and Isobel White have been finding out all about her in preparation. I moved to Leicester to work among the women in the shoemaking industry. Mrs Hawkins, the WSPU secretary, was also active in the Bootmaker’s Union. She introduced me to a small producer’s co-operative factory…At night I held meetings for the local WSPU, amongst whom only Mrs Hawkins, as yet, dared mount the platform. The members were then almost all working class. Alice Hawkins was born in Stafford on 4 March 1863 and moved to Leicester in her early years. She began work at the age of 13 in the new Co-operative factory, the Equity Boot and Shoe Co-operative in the city. By the 1890s she had become involved with the infant Labour Party and the Women’s Co-operative Guild. Within these groups the women of Leicester fought for a realistic minimum wage and campaigned to improve working conditions in the factories. The Leicester branch of the Women’s Social and Political Union (WSPU) was formed in April 1907 and was begun primarily by working class women, who had working class motives. In February 1907 Alice had been to London to attend the Women’s Parliament in Caxton Hall, organised by the WSPU to take place the day before the State Opening of Parliament. After there was no mention of women’s suffrage in the King’s Speech on 13 February the women made an assault on Parliament; Alice Hawkins took part and was one of over 50 women arrested that day. Alice witnessed mounted police riding the women down and was later to write to Ramsay MacDonald, then the MP for Leicester, from Holloway Prison deploring the use of such force: “no other civilised country would treat women in such a manner”. Her experiences that day and her time in prison led to her establishing a Leicester branch of the WSPU. 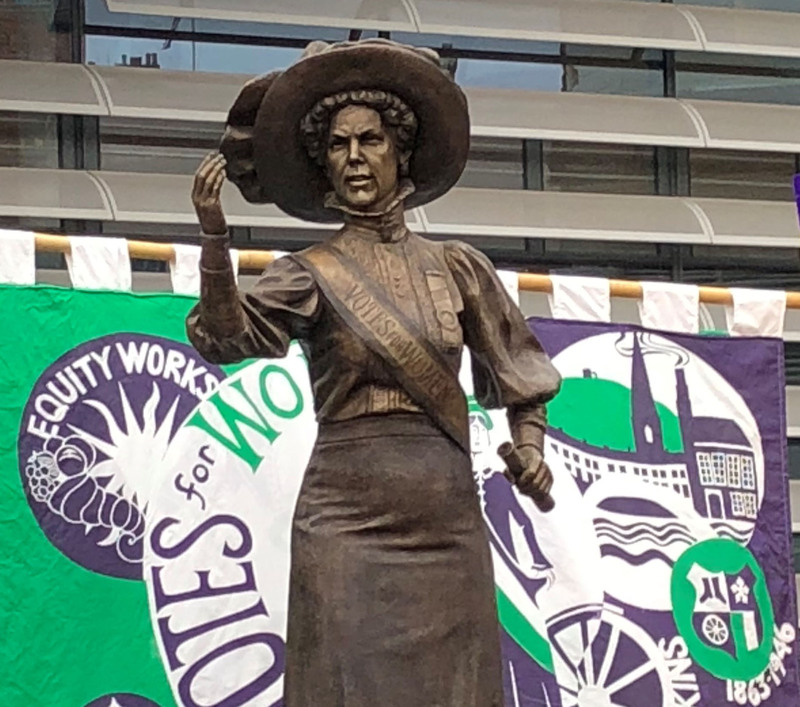 From its beginning the Leicester branch of the WSPU benefited from national leaders coming to speak in the city, and in July 1907 Alice Hawkins and Sylvia Pankhurst addressed a large crowd in Leicester market place. The Leicester Evening Mail reported Alice’s death in March 1946 and stated that she had been jailed five times during her campaign for votes for women. Alice Hawkins was first imprisoned in 1907, for seven days, in Holloway Prison. Her second prison sentence was in September 1909 after she had been arrested for disrupting Winston Churchill’s meeting of the Liberal Association in Leicester. Her husband, Alfred Hawkins, who supported his wife’s views and the aims of the WSPU, was also arrested. He paid a fine and returned home in order to keep the family going, but Alice elected to go to prison, where she went on hunger strike for the first time. The importance of Alice to the national WSPU movement is underlined by her selection to be part of the 1910 Deputation to the Prime Minister in protest at the failure to proceed with the Conciliation Suffrage Bill. Along with 300 suffragettes, Alice Hawkins waited in nearby Caxton Hall until Mr Asquith announced the delay. Each had a white satin badge, with ‘Deputation 1910’ on it. They marched to Parliament where they were met with a violent response from the police. The Daily Mirror published a photograph of suffragette Ada Wright, lying collapsed on the ground, her hands clutching her bloody face, she was one of many injured during the march. The following day, the Home Secretary, Winston Churchill, decided that there would be no public interest in prosecuting the arrested women and men, embarrassed by the injuries and sexual assaults undergone by the protesters. Four days later Alice was part of the deputation to 10 Downing Street, where she was again arrested, but this time for breaking the windows of Edward Harcourt, a Cabinet Minister. She wrote to her husband, Alfred: “I volunteered to lead 12 to Mr Harcourt’s house…it was easier to break windows than have my body broken.” Although sentenced to 14 days on 23 November, Alice appears to have had a fine paid for her, and she was released. On 21 November 1911 Alice Hawkins organised the breaking of windows at the Home Office on Whitehall, as part of a WSPU protest against the failure of the Government to include women within its manhood suffrage bill. Alice was told to meet at group of women at the WSPU shop at 156 Charing Cross Road, where they collected bags of stones and hammers, and began their action. She was sentenced to 21 days and was imprisoned. Alice, in line with WSPU policy, went on hunger strike, and was subsequently awarded a WSPU hunger strike medal. Alice continued with her trade union activities in Leicester, becoming involved in the struggle for women to win equal pay in the shoe trade. After encountering obstruction from male trade unionists, she formed the National Union of Women Boot and Shoe Operatives in 1910, with another WSPU colleague, Lizzie Wilson. The Union survived until the 1930s, helping to win better pay and conditions for women in Leicester and its environs. The women’s labour movement was growing nationally alongside the women’s suffrage movement, both enabling women to campaign to improve their situation. In 1912 and 1913 the WSPU began to lose ground among working class women, particularly when the Labour Party Conference committed itself in 1913 to opposing any suffrage bill which did not include women, and the National Union of Women’s Suffrage Societies began to support Labour candidates. During 1912, the willingness of Christabel Pankhurst to encourage acts of violence and arson led to concerns among many WSPU members and a loss of public support. In Leicester, the WSPU branch continued its drive to recruit working class women, and Alice continued to believe that the WSPU represented the best chance of achieving the vote. As a representative of the Women’s Boot and Shoe Union, Alice was part of the deputation organised by Flora Drummond to meet Lloyd George, Chancellor of the Exchequer, in January 1913. Alice’s presence was an important indication of working class support for the WSPU. The unsuccessful deputation was followed by window smashing. Alice Hawkins was imprisoned for the final time on 2 July 1913 for a month for damaging the Royal Mail pillar boxes with “Brunswick Black”. At her court appearance, she indicated that she would hunger strike. She had targeted post boxes around Leicester. The outbreak of World War One in August 1914 ended the WSPU campaign and in February 1918 the Representation of the People Act was passed giving some women over 30 the vote. Alice joined the Labour Party and thereafter devoted herself to encouraging trade unions and socialism. She died on 12 March 1946, aged 83, and is buried at Welford Road Cemetery, Leicester. Peter Barratt, Alice Hawkins’s great grandson, speaks regularly about his great grandmother and the family created a website, Alice Hawkins Suffragette: a Sister of Freedom, in her memory. 4 February 2018 Statue of Alice Hawkins awaiting unveiling. On 4 February 2018 a bronze statue of Alice Hawkins was unveiled in Leicester’s new market square, near where she had addressed crowds in the early years of the twentieth century. The seven foot statue was funded by local businessman Jamie Lewis and the sculptor was Sean Hedges-Quinn. Alice is wearing her speaker’s ribbon, her hunger strike medal and the Holloway brooch designed by Sylvia Pankhurst and awarded to the members of the WSPU who had been imprisoned. Statue of Alice Hawkins by Sean Hedges-Quinn unveiling on 4 February 2018 in Leicester.